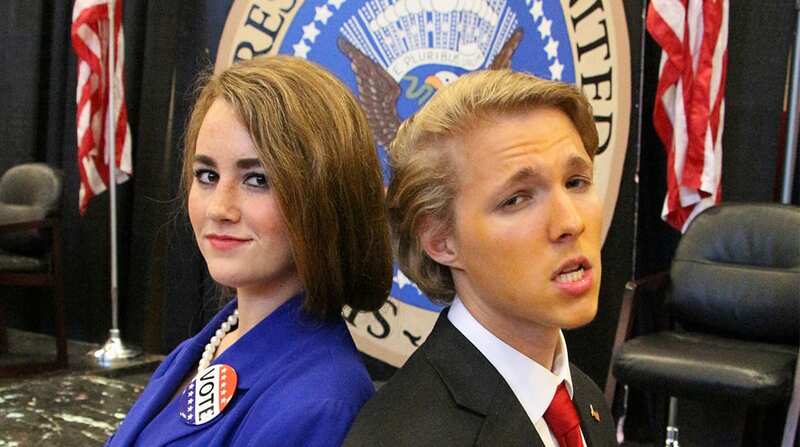 Parkway’s mock presidential race brought Hillary Clinton (played by Shelby Newman) and Donald Trump (played by Jonah Pease) to the south Bossier school last week. Students cast their votes and elected Trump by a landslide. Parkway High School has held a mock election every presidential election year since 1972. They’ve only been wrong four times. This year, the school picked Donald Trump as the next President of the United States. Will they be right? Meredith McGovern, Social Studies Department Head and instructor, said they begin planning the mock election at the beginning of the school year. Auditions are held and work begins as soon as the cast is announced. This year’s production was over the top. From celebrity performances to talk show appearances, students went all out this year. One reason, McGovern suggested, is because of who the candidates are. Students researched and wrote their own speeches and presented them before the student body. Candidates were Donald Trump (played by Jonah Pease), Hillary Clinton (played by Shelby Newman), and Gary Johnson (played by Devon Salvetera). The event culminated with students casting their votes in the 2016 Electoral College. After all 50 states were counted, Trump was the victor. But what’s the lesson here? As for the real election results, there are bragging rights at stake. “I think they are hoping they get it right this year,” McGovern said.